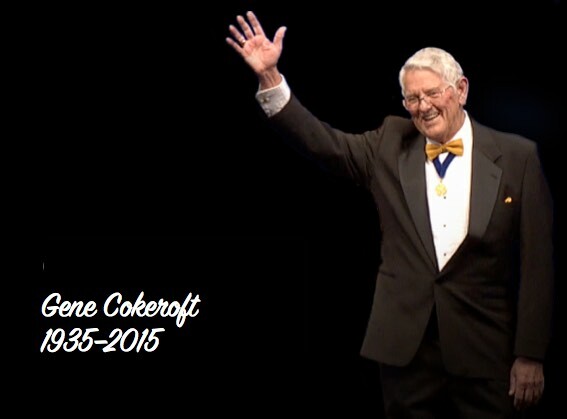 Home / Members / Chapter Eternal / Society mourns passing of Gene CokeroftBecome A Member! The Barbershop Harmony Society celebrates the life and legacy of Gene Cokeroft, a genial giant of our musical art form and culture. His towering achievements in any of a number of areas would qualify him as “unforgettable” — but to have mastered so much, and given so much to the development and growth of barbershop harmony, makes him a true legend. Most Barbershoppers would recognize Gene primarily as the tenor of 1961 International Quartet Champion The Suntones, a landmark, trendsetting quartet whose musical innovations and wide-ranging public appearances brought the style to millions of listeners. A committed chapter chorus director, Gene helmed the Miamians Chorus for more than 40 years. In the past decade, Gene has devoted himself to bringing barbershop to a new generation of singers, as a key player in the outreach movement. He formed, directed and took the Young Miamians to the International Youth Chorus Festival in 2009, a group which proved a hotbed of young talent. For these, and many other unsung moments of mentorship and joy, Gene Cokeroft earned the distinction as the only man to TWICE be inducted into the Barbershop Harmony Society’s Hall of Fame: first in 2005, as part of The Suntones, and again in 2009, as an individual of immense merit.